This page has information about Chesapeake Bay blue crabs, sometimes called hard crabs or simply crabs. Blue crabs are an important link in the food chain, feeding on fish, aquatic vegetation, mollusks, crustaceans, and annelids while they serve as prey to mammals, birds, and fishes. Blue crabs are prized by seafood lovers, usually served steamed whole or with the top shells removed. In the Chesapeake Bay region they are traditionally seasoned with a spicy crab seasoning in the steamer and again when served. Male crabs can be distinguished from females by the shape of the abdomen. Male blue crabs have a T-shaped abdomen that is held tightly against the body until mature when it becomes free to move. Immature females have a triangle-shaped abdomen that is tightly sealed against the body. The mature female’s abdomen becomes rounded and can be easily pulled away from the body after the final molt. Female blue crabs carry fertilized eggs under their abdomen. The eggs resemble a sponge and egg bearing females are called “sponge crabs”. It takes about two weeks for the eggs to ripen and be released into the water to hatch. Large male blue crabs, called “Jimmy crabs” have brilliant blue claws and legs. The mature females or “sooks” can be distinguished by the bright orange tips on their claws. Males typically grow larger than females, sometimes reaching 7 or 8 inches in point-to-point width. Some males have been reported to grow to about 10 inches. In the Chesapeake Bay, blue crabs are harvested using trotlines, crab pots, bank traps and with dip nets. 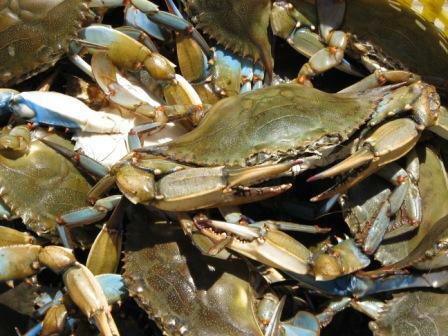 Maryland, Virginia and North Carolina are among the top blue crab harvesting states.